Heat oven to 325°F. Place paper baking cup in each of 18 regular-size muffin cups; lightly spray paper cups with cooking spray. In medium bowl, mix crushed cereal and melted butter. Press about 1 tablespoon crumb mixture firmly in bottom of each muffin cup. Set aside. In large bowl, beat cream cheese and granulated sugar with electric mixer on medium speed 3 minutes or until light and fluffy. Beat in eggs, one at a time, just until blended. Add lemon peel, lemon juice and vanilla; beat just until blended. Spoon filling evenly into muffin cups, filling each about three-fourths full. Bake 25 minutes or until filling is set and edges are lightly browned. Cool 10 minutes; remove from pan to cooling rack. Cool completely. Refrigerate until chilled, about 2 hours. 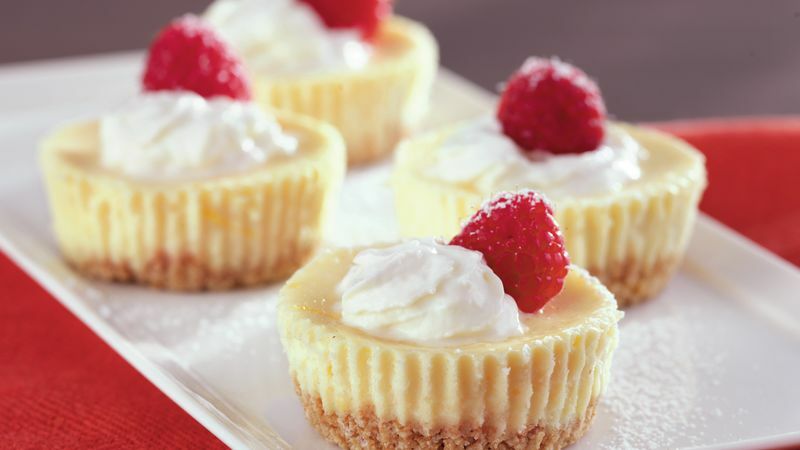 To serve, remove paper cups from cheesecakes. Garnish with whipped cream topping, raspberries and powdered sugar. Store covered in refrigerator.